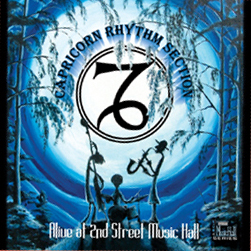 Samples from "Alive at 2nd Street Music Hall"
CAPRICORN RHYTHM SECTION. Never heard of them? How about Capricorn Records? You remember, Duane Allman, the "Allman Brothers Band", Dickie (Richard) Betts, the "Marshall Tucker Band", Bonnie Bramlett, "Wet Willie", "Cowboy"? Well, the members of the CAPRICORN RHYTHM SECTION are some of the ones responsible for producing their records, playing on them and writing songs they recorded. Years before Capricorn Records put the genre of music known as Southern Rock on the map in Macon, Georgia, Johnny Sandlin and Paul Hornsby joined forces with Duane and Gregg Allman to form the "Hour Glass" band. Scott Boyer was playing in the "31st of February" with high school friend, Butch Trucks. Bill Stewart was making music in "South Camp" and Tommy Talton was on the road with "We The People". Then along came Phil Walden and Capricorn Records. By that time, the "Hour Glass" had disbanded and Allman was living in Muscle Shoals doing session work where he was discovered by Jerry Wexler. Wexler alerted Phil Walden who immediately signed Duane to his new record label. One of the earliest visions Phil Walden had for his new record company was a rhythm section in the image of those at Stax and Muscle Shoals Sound. Duane recommended his friends and former "Hour Glass" bandmates, Johnny Sandlin and Paul Hornsby, to put the band together while Allman, along with others in the newly formed "Allman Brothers Band", became an "unofficial" member of the Rhythm Section. By 1970, Sandlin found himself busy producing and heading up Capricorn Records A & R department. Bill Stewart, the first drummer for "Wet Willie", was asked by Sandlin to take his place on drums. Around the time Hornsby began devoting most of his time to producing, Scott Boyer and Tommy Talton, members of the Capricorn act, "Cowboy", joined the rhythm section, and for the remainder of the time at Capricorn Records, the Capricorn rhythm section was a blend of current and past members, the ABB and other label acts, everyone playing whenever needed and called upon. Cowboy "Reach for the Sky" Dickey Betts "Highway Call" Gregg Allman "Laid Back"
Now, after years of pursuing their individual careers, Scott Boyer, Tommy Talton, Bill Stewart, Paul Hornsby and Johnny Sandlin have come together again to play some of the classic music they helped create and new music of their own. CAPRICORN RHYTHM SECTION. Still think you haven't ever heard of them? Sure you have...you just didn't realize it until now!